From some pieces of black, white and yellow card, and some punches this easily made card is another from the Novelty Cards section. All you need to do is punch out as many black circles as you want penguins. This is for the main body part. Punch out the same number of white circles for the breast part of the bird, but make them smaller. Punch out a small yellow circle for each penguin, and each one of these will be cut in half to make two feet. I have used Googly Eyes for each of my birds. 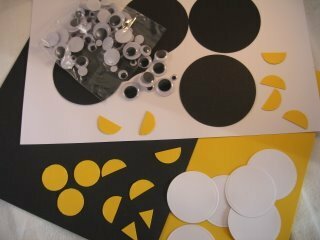 You will also need some small triangles in the yellow card for the beaks. Layer up the white card on top of the black circle. Add the two yellow feet to the bottom of the body. 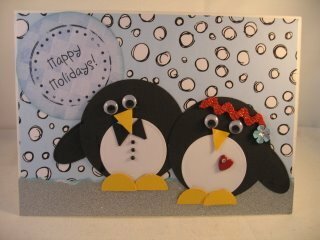 I have added the arm to the outer side of each penguin. The embellishments are from my stash. They include some black stick on pearls for the male penguins button, a small piece of red ric-rac for the females head band along with a sequin flower. I have added a red heart with a tiny gemstone to her, and cut a bow tie from the black card for him. I think they look really cute...don't you?